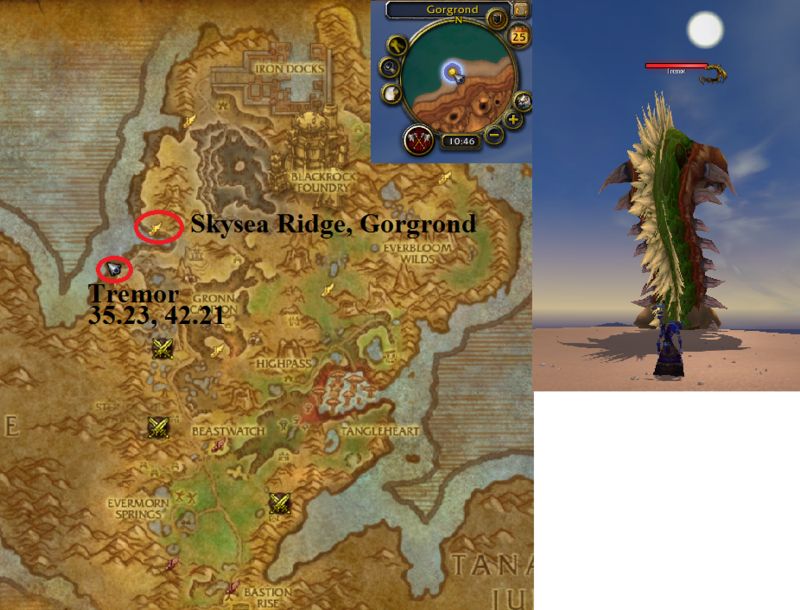 Tremor spawns just southwest of Skysea Ridge down on the shore. He is easily soloable if you have some moderate self heals and a defensive or two. He does an aoe that does quite a bit of damage, so use a defensive. During the fight he will burrow underground and spawn adds. The adds do a decent amount of damage if you don't down them fast enough, however they have very little health and will die very easily with aoe. The large adds drop a trap that you will need to pick up and will give you a boss button that can trap Tremor. If you do not use the traps he will resurface only to burrow again and spawn more adds. Very easy fight as a 680 Fury War. Be sure to pick up a net that drops and trap Tremor. It stops him from going underground ans speeds completion. This is a reference to the movie called Tremors. Matar Tremor a oeste da Queda de Gorgorek, em Gorgrond, e obter a Pilha de Lagostroks Semidigeridos. O entreposto de Gorgrond está tendo problemas com os saberons e não podemos continuar enviando tropas para lá. Fica sussa, que eu tive uma ideia. Tem um verme gigante na costa oeste de Gorgrond chamado Tremor, o devorador de lagostroks. Se tu matar a fera e trouxer uma pilha de carne de lagostrok pra cá, a gente pode fazer um rango, mandar pro entreposto e dar uma acalmada nos saberons! What be that awful smell? Dis be exactly what we need, commander. I'll send it to da chefs right away.